Behind margaritas, lemonade is the quintessential summer drink. Over the past year or so I've been experimenting with different variations - sparkling strawberry lemonade, basil-infused lemonade, sparkling lemonade, roasted peach lemonade, limeade, and now this blackberry lemonade. To be honest, I made this out of necessity, but I'm so very glad that I did. We were getting ready to head to the beach for the week, and I wanted to rid our house of any and all produce that could spoil. I had some blackberries and lemons in the fridge, so the blackberry limeade recipe that I saved a year ago became sparkling blackberry lemonade! This comes together in minutes, is a perfect balance of sweet and sour, and most importantly - look how pretty it is! I am totally addicted to sparkling water, so I of course love it in this lemonade. The little bubbles are so refreshing, and it makes the drink seem fancy and special. This would make a wonderful addition to a cookout this weekend, and if you're looking for an adult beverage, I think vodka, gin, or even sparkling wine would be great. Note: I like my lemonade on the tart side, so feel free to use less lemon juice and/or increase the sugar for a sweeter drink. Also, if you don't want sparkling lemonade, just omit the sparkling water and replace with 2 cups of still water. In a blender or food processor, combine the blackberries and 1 cup of the water. Puree until smooth, then press the mixture through a fine-mesh strainer to remove the seeds. 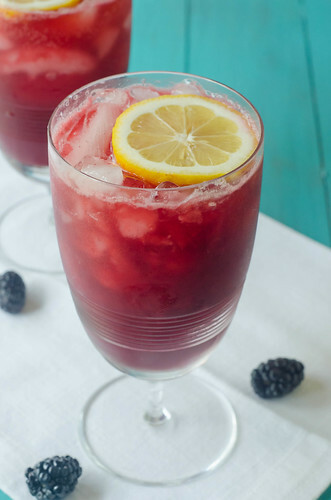 In a pitcher, combine the blackberry puree, sugar, lemon juice, and the remaining water. Stir well to dissolve the sugar. Chill until ready to serve, and top with the sparkling water just before serving. Love this! It looks and sounds super refreshing! I love lemonade in the summer! so good! I'm going to make a big pitcher of this for this weekend--looks so refreshing and SO beautiful! Yum! I could go for a cold glass right now! I love ranch dressing. Glad to find a light version to be able to enjoy it more often. pinned! I am with you on the mayonnaise thing, except my dislike for it borders on phobia! Not kidding... but maybe this dressing may turn me! this looks delicious and i avoid ranch b/c it's so unhealthy! i think you meant "thicker" in last line!